I was a bit surprised to find George in jeans and a motocycle helmet when I arrived after breakfast in front of the hotel. Apparently his legs needed a rest day after leading our co-visitors Mike and Alexis the past few days. 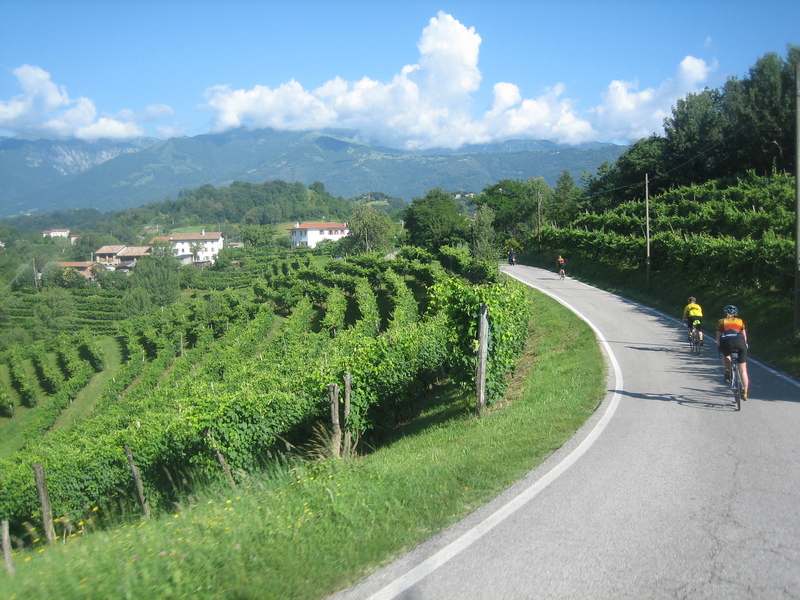 His plan was to motor-pace us on a route toward the east to Asolo and Montebelluna on country lanes. The pace today ws always brisk, as whoever of us wanted to lead at a given moment could tuck in from out of the wind behind George on his surprisingly quiet cycle. The uphills were all short, just rollers, except for one little 16% wall after our turnaround cafe. The pastries were delightful, a wonderful alternative to a Cliff bar. And Sherie’s hot chocolate seemed to be liquid decadence in a cup. Many miles past beside cornfields, vineyards, and homes of all ages. There were many cyclists of all ages and paces on the roads enjoying the fine day. When Mike had a front flat (again, as his front tire had multiple flats the previous days), George led us into a town to a bike shop to purchase a new tire. The shop had bikes for all ages and tastes, from tots to racers. It featured Ridley and Scott bikes, road and mountain. The matron and patron seemed friendly and greeted George warmly. 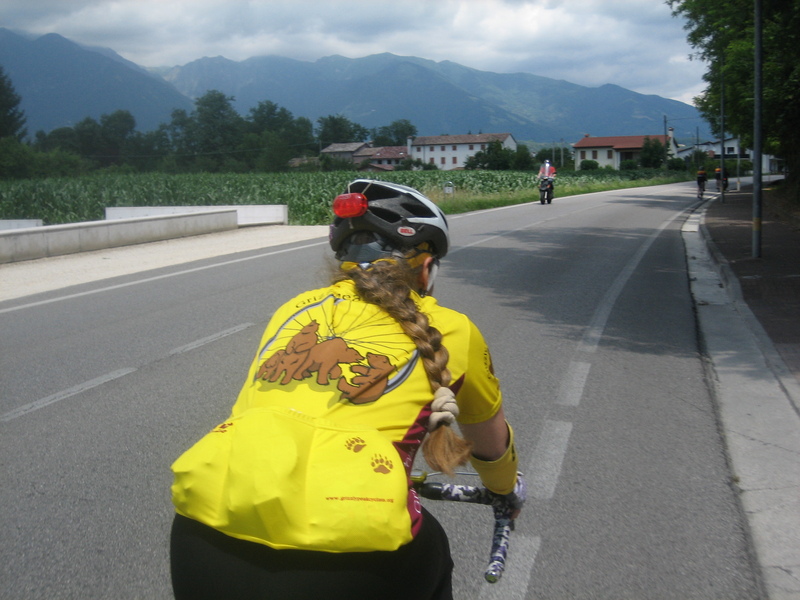 One high point of the ride was a section on a narrow road alongside a canal. It fed water across the base of the hill that was the landscape feature of around which we navigated today. While we traversed, many mountain bikers rode as well. Apparently, this weekend features a UCI mountain bike race on some trails on this hill. When we arrived back at the hotel for lunch, Mike announced that this was a very fast ride today, that he averaged 15.7 mph. 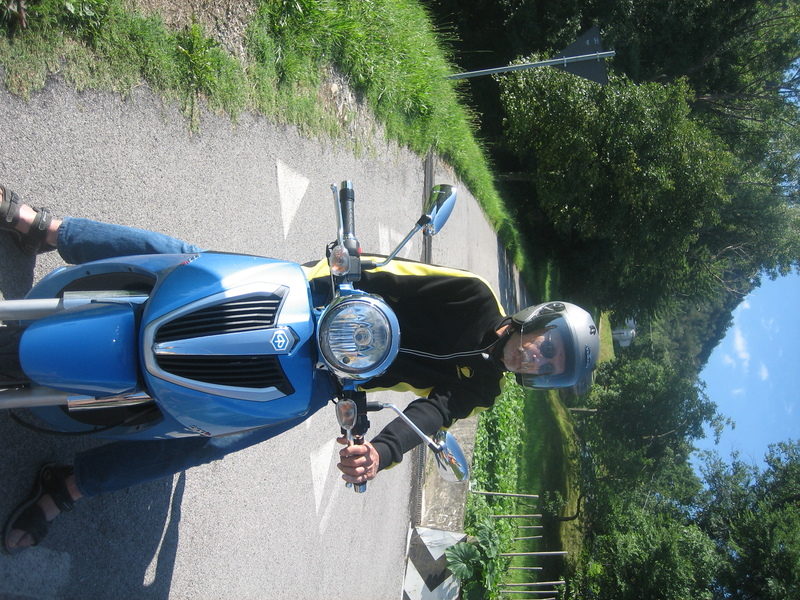 Apparently George pushes the pace on the motorbike, as long as one of us stayed near his wheel. Mike took the credit (blame) for keeping the pace high; Sherie and I had many a moment when we worked hard to catch back on a wheel although except for the short climbs never dug too deep for energy. We had a great lunch again, featuring a garlic/hot-pepper spaghetti and rabbit with polenta. Not to mention the usual salad, the cooked bell peppers, fried potatoes, and dessert.